As men become more aware of the jewelry that they wear, the demand for mens jewelry with exotic gemstones would show a rapid increase. There are few gems that fit the category of 'exotic' gems and no other gemstone deserves this title better than tanzanite. This gemstone does not have a very long history, but it has managed to become one of the hottest gems in the industry within a few decades of it's discovery. Tanzanite rings for men are special, they represent a gemstone that is found in just one location on earth. As expected, the gemstone is rarer than a diamond. 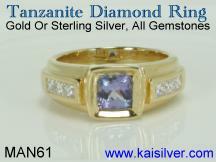 Mens tanzanite gemstone rings can be crafted in gold or 925 silver. While it is true that tanzanite like other rare gems is generally used in gold jewelry, there is no reason why you cannot get a fine quality men's sterling silver tanzanite ring. As far as tanzanite gold rings for men are concerned, yellow gold dominates though, white gold is soon becoming popular among men. The violet-blue color of tanzanite ensures that it looks equally stunning in yellow or white gold. You might not gave come across a pink gold tanzanite mens ring, it is an option that you might want to consider. The color of tanzanite against the light pinkish (rose) color of the gold, strikes a unique and subdued contrast with the metal. For mens silver tanzanite ring, you could leave it unplated and get that classic, reliable feel and look of silver. If you do plan to request for a rhodium or gold plating for your tanzanite silver men's ring, keep in mind that any type of plating done on silver will not last forever. 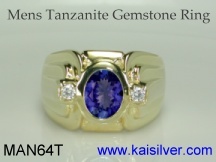 A mens tanzanite ring especially if designed and crafted by Kaisilver, is perfectly suited for a mens wedding or engagement ring. You could also wear your tanzanite gemstone ring as a high-end fashion accessory. Many gem lovers are not aware that, tanzanite was the last gemstone (until now) to be added to the birthstone charts. Men born in the month of December, now have the gorgeous tanzanite gemstone as an option for their birthstone. You could therefore, get a fine tanzanite mens ring as a birthstone ring too. 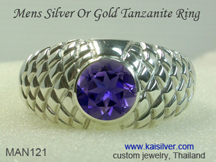 Kaisilver Rings: All our jewelry include the mens tanzanite mens ring collection, is fully custom made. This means that we can custom make your tanzanite gemstone ring for men with the design of your choice. You could also pick any of the rings on our website and request for it to be made with a tanzanite gem. We have always been known for our high quality standards and you will be glad to know that, this obsession to craft quality jewelry extends to both gold and 925 sterling silver jewelry. Our support teams at sales@kaisilver.com will be glad to answer any gem or jewelry queries that you might have. We believe in educating and providing information rather than, pushing for a sale. So do contact us irrespective of where you plan to buy your gems or jewelry from. Below are few examples of the features and quality that get incorporated into the tanzanite mens rings that we craft. A handsome mens tanzanite gemstone ring, immaculate design and fine craftsmanship ensure that this high-end ring is impressive and durable. While the image shows a mens gold tanzanite ring, it is hard to imagine that you could ever get the same fine quality for a tanzanite mens silver ring. The good news is that, all Kaisilver jewelry is provided with the same quality of gemstones, design and craftsmanship irrespective, of the metal that you choose. While 14k and 18k gold are options for the gold tanzanite gemstone ring, you can also make a choice of yellow, white or rose gold for the jewel. Since each mens tanzanite ring is custom made, we can accomodate all design modification requests and satisfy all ring size requirements. We handpick and custom cut every tanzanite gemstone that we use, we are not restricted to a fixed gemstone inventory or to standard jewelry moulds and blocks. The center oval gemstone in this tanzanite ring for men measures 9x7mm and the round side diamonds have a size of 2.5mm. The 925 silver mens ring has a weight of 15 to 20 grams and the mens gold tanzanite ring has a weight of 20 to 25 grams. Read more details about the MAN64T tanzanite mens ring here. A men's silver tanzanite ring with the same quality of craftsmanship and gemstone as the gold version. You can order the MAN121 men's silver ring in gold or silver but, the silver ring has been one of our top sellers for many years. Kaisilver put an end to the long standing belief that, silver jewelry cannot have the same quality as gold jewelry. The same team of expert artisans and gem cutters from Thailand work on each jewel, the detail to attention and the passion with which each jewel is crafted remain the same - irrespective of the metal choice or price tag. The criss cross pattern done on the metal for this tanzanite ring for men, can be replaced with the pattern of your choice. We can also leave the metal with a plain high polish finish. The researched design for the ring provides not just a handsome look but also, additional durability to the jewel. Caring for a men's silver tanzanite ring is not complicated once you understand, the basic characteristics of the gemstone. Read the full report and get comprehensive details for this tremendous men's ring with tanzanite gem stone ... here. This tanzanite diamond ring for men, is a symbol of luxury. The MAN61 mens tanzanite and diamond ring is sturdy, handsome and spectacular. The design for this mens tanzanite ring was developed with the objective of incorporating maximum durability into the ring. The center cushion shaped tanzanite gem is set with a slight recess in the metal mounting, this prevents the gemstone from being struch by frontal impact. The channel set diamonds are also mounted into the metal. While you could wear this tanzanite gemstone ring for men as a casual wear jewel, there is nothing that prevents it from being worn as a stunning mens tanzanite wedding or engagement ring. Like always, you have the option of ordering the MAN61 ring as a gold or 925 silver tanzanite mens ring. You can choose from 14k or 18k gold and even get the same quality of gems, diamonds and craftsmanship for a sterling silver mens tanzanite gemstone ring. Complete gem options are provided for the ring and the side diamonds, could be replaced with any other gemstone of your choice. The ring is made to order in all ring sizes. Get complete information on this awesome men's ring here.